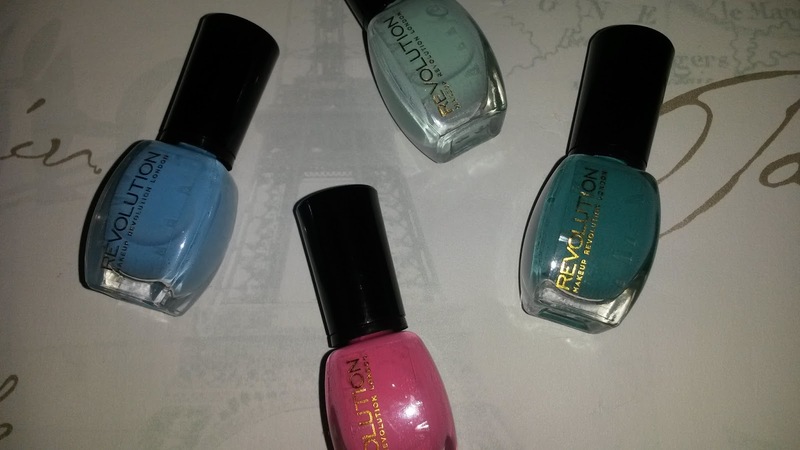 Being the nail polish fanatic I am, I was very please to see that new brand Makeup Revolution had over 40 shades in their nail polish collection and that's not even including the glitters that are available to buy. For just £1.00 they don't break the bank, are very affordable and you're getting a decent amount of product. The bottles are pretty basic with sticky labels, but who are we to complain at just one pound a pop. L-R: Trust Me, True Blue, You Need Love and Cool Days. Not going to lie when I first tried these I felt slightly disappointed, or maybe it's just me being picky. My problem? The drying time. 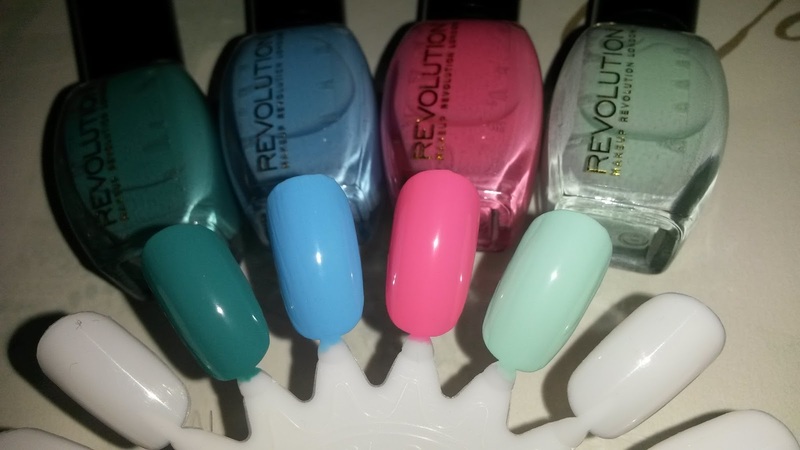 Now, you're all probably sat there reading this thinking 'oh great, another nail polish that takes forever to dry', when in fact, these polishes are the most fast drying nail polishes I've come across in a long time. When applying these nail polishes you are met by a somewhat sheer coat and they definitely need a good few coats to build a good coverage, but I found that once the first coat applied applying a second could be a little bit of a nightmare. I'm all about a smooth finish, so when I applied the second coat this was when it went a little wrong, I found the second coat clung to the first coat and dried so quickly that you didn't have time to have a play around creating that much desired smooth finish. Now, it's not all disappointment because I found the trick to making these polishes work for me. I decided to apply a thicker coat, this didn't at all affect the drying time, though it did take a little longer but not much longer to dry may I add. The thicker coat allowed me more time to play around and create the smooth finish that I desired and the results were pretty amazing. Yes, I still needed quite a few coats but for £1.00 a bottle the finish was beautiful and now I'm happy Kate. I've read a few reviews on these and people are not disappointed with these, like I said it's probably me being picky but they're well worth picking up. Just remember my tip; apply a thicker coat. Trust Me is perfect for Autumn/Winter. True Blue and You Need Love are Summer must haves. Cool Days is the one to wear for Spring. You can check out more from the brand. Naked 3 dupe here & lots of swatches here or lip lacquer here. They look lovely in your second photo - all of the colours are really nice! Great tip Kate, the shades are lovely for Spring and you can't say no to the price, xoxo. Me too. If you put a thicker coat on it gives you time to play around and create that smoother finish, I definitely recommend picking up a few and giving them ago. A lot of people are impressed, I however am just fussy. There a steal at just £1.00 and the finish is beautiful!